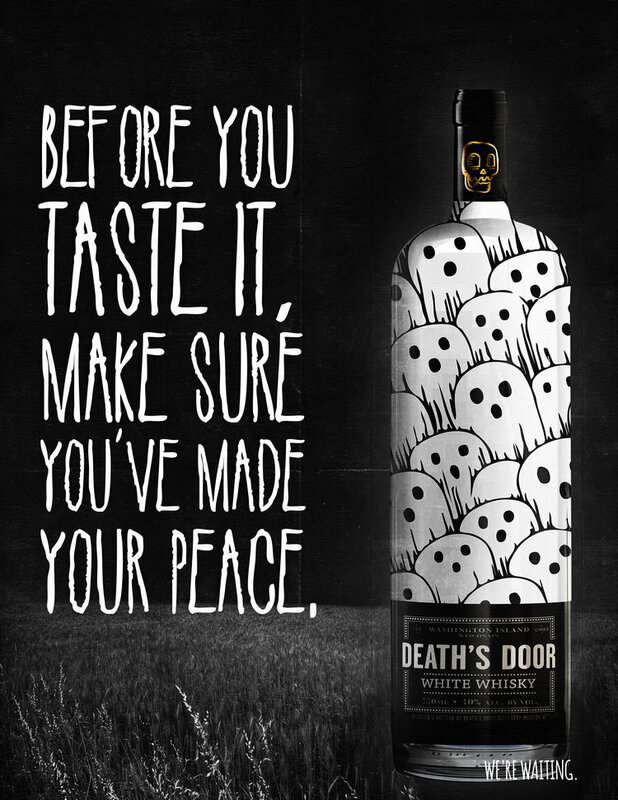 Death’s Door is a whisky (not whiskey) that reminds us death is always around the corner. Drink it while you can. If you’re knocking at death’s door be sure to keep a few coins in your pocket. You never know when you’ll have to pay the ferryman his toll. Coasters with the dark legends of Death's Door will tell people just how this whisky got its name. Five hundred Native American Warriors set out to attack an enemy tribe. While crossing the treacherous pass a storm struck. Some say the Witiko spirit that guards Death’s Door was angry, it was being used for evil. In an instant the wind picked up and giant swells rose from the calm water. The warriors were crushed under the waves and Death’s door opened and swallowed them whole. To this day their souls remain trapped beneath the water. Forever to walk the path, hoping to find their way to the other side. Said to be the sirens of the great lakes. Like the tale of Homer; they are incredible and beautiful, but have the tails of foxes and hollow backs, like that of a rotten log. The sirens would call to the sailors traveling through Death’s Door. They sought to seduce the human men and marry them in order to lose their tails and become mortal. Many ships crashed along the way, following the call of the sirens, some were simply unable to satisfy their desires and were eaten alive as punishment. Ships rarely travel through Death’s Door now, and it’s believed that when the wind begins to howl, it is the Huldra searching for sailors, hoping to be freed. Le Griffon was the greatest ship of its time. Fearing this powerful vessel would anger the spirit of Death’s Door, it’s said a curse was placed upon it. On the return from its maiden voyage, the ship passed through Death’s Door, and was never seen again. Some believe that the spirit feasted on the ship and its crew, others say it simply sank. To this day no one has found its remains. But, when the moon is full and the souls of the crew grow restless, many claim to have seen the ship's ghostly silhouette in the fog and the sound of its tattered sails flapping in the wind.